Blended learning doesn't mean just getting "technology" into classrooms. Blended learning is a disruptive innovation in education that personalizes the learning experience by meaningfully integrating supervised, face-to-face instruction in a brick-and-mortar location with online instruction in which students have some control over time, place, path, and/or pace. Effective blended learning takes advantage of each mediums' strengths and uses them to support and enhance each other. Ideally, a blended learning model should make the most of all the tools educators have access to in order to build a scalable, personalized learning experience for every student, an experience in which students have some control (and teachers aren't crazily overworked). In practice, however, this is not easily achieved. Discrepancies in technical literacy, lack of seamless tool integration, stagnant and/or non intuitive user experiences, and difficulty in merging face-to-face instruction with the virtual experience in productive ways are some of the common challenges in taking full advantage of a blended learning environment. As a versatile and dynamic LMS (that is much more than an LMS), Buzz is poised to help educators meet those challenges with features that support the following solutions. As classroom sizes grow, it becomes increasingly harder for teachers to accomodate the needs and pace of every student. Some teachers end up teaching to those who struggle most so no one is left behind, while others teach to the highest performers, hoping for some kind of trickledown. Not only does Buzz provide classroom and data management tools to free up time that teachers can use to give students the attention they need, it also provides tools that directly facilitate personalization. Clipboard intervention: Use the Clipboard to quickly provide personalized attention to individuals and groups, and help them find and accelerate their personal pace. You can assign activities, award badges, assign tasks, and message students quickly and easily based on their needs. This is an easy way to provide intervention and direction on the fly; you can even sit with a student, discuss what they are trying to accomplish, and develop and assign next steps and tasks right in Buzz with them. Formative and remediation assessments: Buzz's formative and remediation assessments help identify individual student's needs and provide customized learning opportunities to meet those needs. Formative assessments: When students demonstrate objective mastery on a formative assessment, Buzz automatically lets them skip activities meant to teach those objectives, so they can focus on material they haven't yet mastered. Self Assessment: The Self Assessment feature allows students to evaluate their personal understanding, interest, and effort in a course using a simple four-point scale for each. This is a low-risk and easy way for students to communicate with their teacher, and teachers can use the results to guide intervention and personalized attention. While a blended learning environment is meant to facilitate personalized learning, it shouldn't eliminate the opportunity for students to work together. 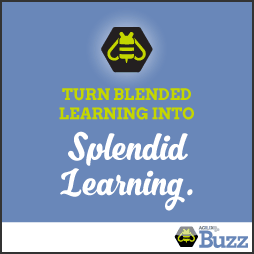 Buzz provides various features that can be used to blend independent efforts with collaborative experiences. Groups: Buzz lets you easily divide your classes into multiple and overlapping group sets. Once you've created groups, you can send group messages, assign group activities, create quick intervention tasks for them, assign group grades, award badges, arrange peer assessments within groups, and filter your list views with them. Buzz eases the logistical nightmares that group work can cause, and lets you focus on helping students get the most out of collaboration. Wiki and Discussion activity templates: Easily create Wiki and Discussion activities in which students make recorded, individual contributions toward collaborative knowledge building and idea exchange. Create and assign a project. Sometimes giving students greater freedom and control over their learning paths leaves teachers with less ability to hold them accountable to standards. Buzz opens up opportunities for authentic choice and exploration without disrupting the teacher's ability to build and follow fair and manageable grading practices. Objective Mastery: Buzz allows you to import educational standards (e.g., federal, state, district), align them with activities to establish learning objectives, and track and review how each student performs against them. Both teachers and students can easily access this information and use it to personalize the learning path. Blended classrooms create opportunities for teachers and students to interact in various ways. Buzz helps you take advantage of these opportunities by providing tools that support personal, immediate feedback, rewarding achievements, reinforcing desired behavior, peer review, and personal reflection for students. Badges: Badges are rapidly becoming a standard way for teachers to reward achievement, reinforce behavior, and verify competency. Buzz lets teachers set up automatic and manually-assigned downloadable badges that students can upload to external badge managers. Journal activity template: Journal activities give students the opportunity to regularly reflect on their experience in a space that only their teacher and they can access. Question-specific feedback: When setting up assessments, you can create feedback to address each possible answer outcome and it will be automatically delivered to students. A learning environment is not truly blended if there is a disconnect between what students do in their virtual space and what they do in their brick-and-mortar environments. Buzz provides a user-friendly, dynamic experience in which all of its tools and features support continuity between online and realworld instruction and classroom management. It integrates with other major learning tools and is connected to an active community of users and technical support who are dedicated to making your blended experience the best it can be. Who's doing work in blended learning? Ready to Blend: “Our mission is to advance the innovation of blended learning through speaking, ​teacher and administrator workshops, and consulting to improve the achievement and well-being of K-12 children in a digital world. Idaho Digital Learning (IDLA): "Improve the quality of learning through innovative solutions, collaborative relationships and the access and application of educational technology." The Blended Learning Universe: "A comprehensive online hub packed with blended-learning resources." Clayton Christensen Institute: "The Clayton Christensen Institute is a nonprofit, nonpartisan think tank dedicated to improving the world through disruptive innovation."